Downtown Disney is my favorite place to visit the minute I land in Anaheim. There’s no cost of admission and there are plenty of options for food, drink, shopping. It’s basically a big party and bustling with street performers. It’s the perfect way to get you excited about your vacation. If you have some time before checking into your hotel room drop your bags off at the front desk and visit for dinner and drinks! Even though it’s not quite as expansive as Disney Springs in Florida, Downtown Disney has a lot to offer. It is also designed with an older demographic in mind. 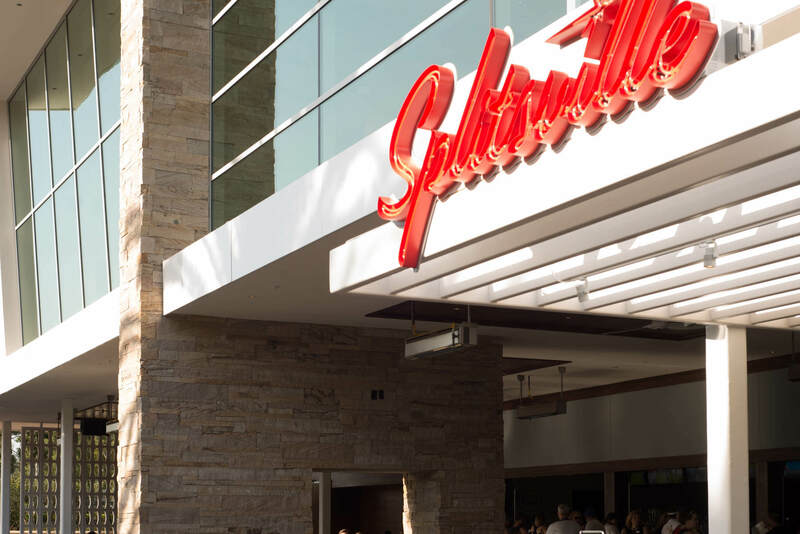 Splitsville: This is a brand-new bowling alley restaurant and lounge recently replaced House of Blues this year. The retro concept is gorgeous and it’s open until midnight for all you night owls. With crazy cocktails and bar food, this is a great place for a night out with friends or a friendly date night! And don’t worry, House of Blues just moved down the street if you miss the old concert and restaurant venue. Star Wars Hyper-Reality Experience: This experience is for Star Wars fanatics over the age of 10. This is a “fully immersive” experience where you’re sent on a mission for the rebellion. You get to see, touch, and interact with the Star Wars environment along the way. Your travel group can go as a unit or join another party if you’re traveling solo is sent undercover on a mission for the rebellion. You can find tickets for the experience here. A Capella Groups and Street Performers: Every few steps you’ll run into either a singing group, a band, and entertainers. 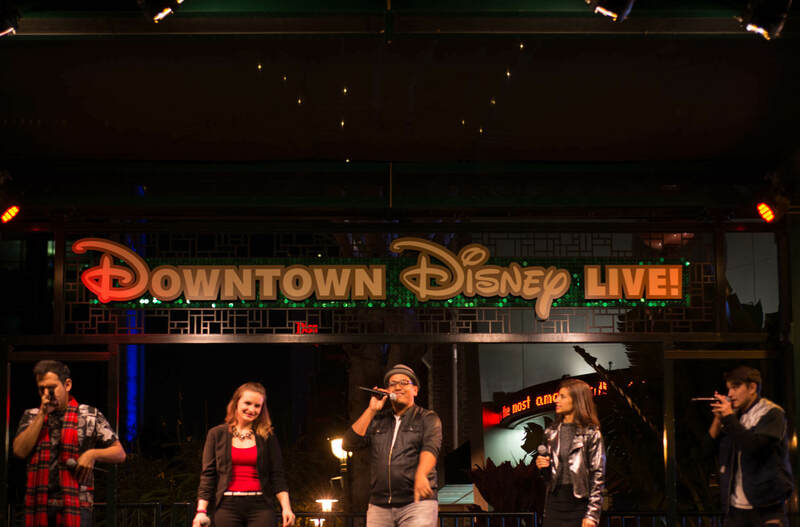 The performers heighten the energy which gives Downtown Disney a party atmosphere. The Disney Dress Shop: They added this new shop to Disney World and Disneyland and I’m absolutely in love. Finally, an adult version of Bibbidi Bobbidi Boutique! (Without all the Fairy Godmother’s, of course.) The dresses, mostly designed by Her Universe, are inspired by the retro/Dapper Day aesthetic with a Disney twist. 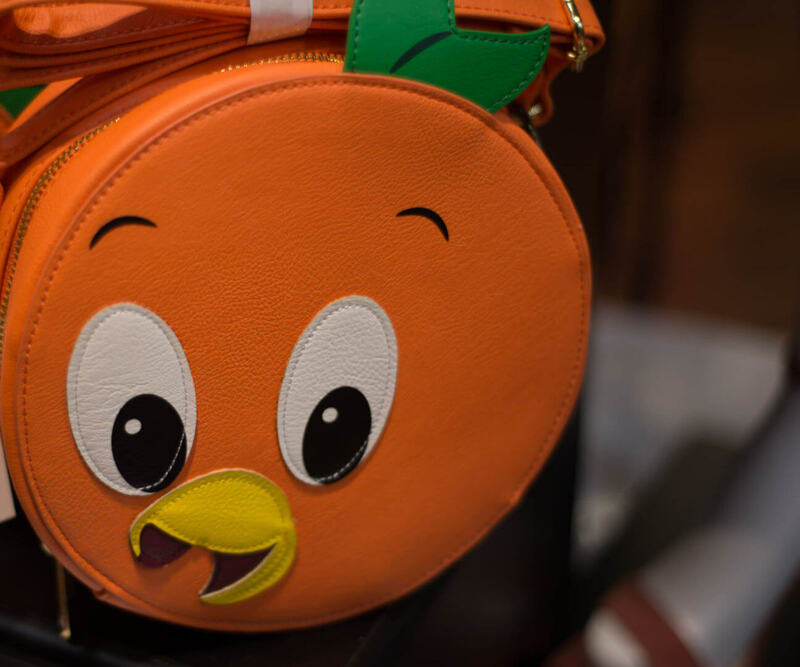 Some of the dresses and accessories are sold throughout the parks as well. If you like vintage, you’ll love this. WonderGround Gallery: Gorgeous Disney-inspired art pieces like custom Vinylmations, giclées, mugs, and more. Also, if you fall in love with a giant painting, Disney can ship it to your home so you don’t have to worry about bringing it on a plane. Sephora: There’s nothing too different about this Sephora, except perhaps, that it’s placed on Disney property. So it’s somehow more magical, eh? Disney Home: More Mickey mugs for me! 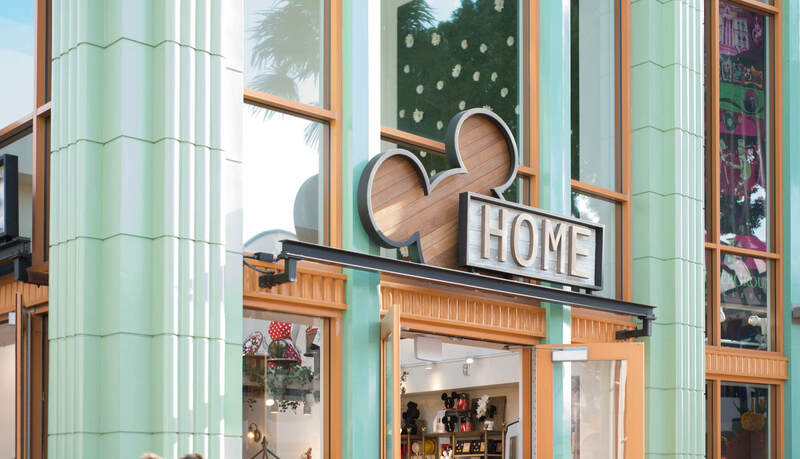 This store has taken all of the Disney themed home goods from around the parks and placed them in one centralized store. The products change throughout the year to fit the seasons. Pandora Jewelry: If you’re a charm junkie you can get all the Disney park-exclusive charms here. I was never too big on charms, but it’s the coolest idea if you’re looking for something to collect every time you visit the parks. Even though they’re spendy, it’s good quality jewelry. The most important meal of the day! 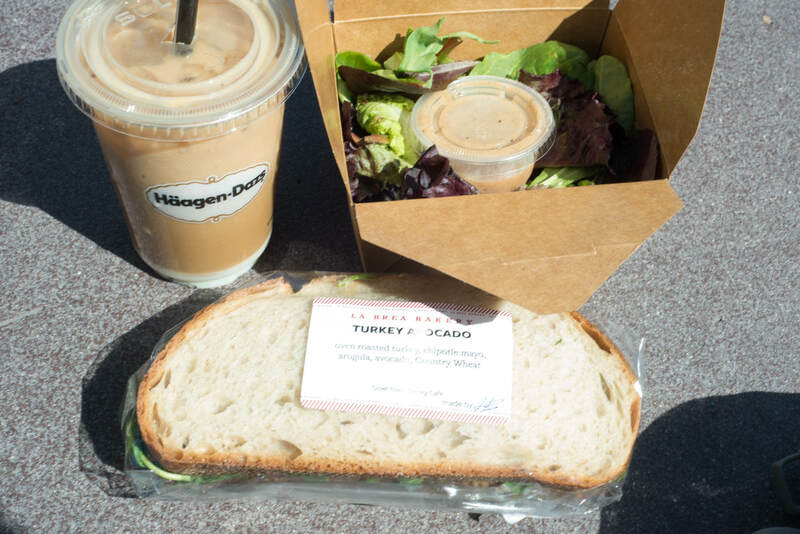 I’m gutted that my favorite place to get coffee, Haagen-Dazs, is now closed but I’m delighted that they’re replacing it with Salt & Straw. The next place I suggest is either the Starbucks next to World of Disney or La Brea Bakery where you can pick up fresh pastries and breakfast sandwiches! For great coffee choices in the rest of the parks check out my full guide to good coffee at Disneyland! Salt & Straw: Opening late 2018! This specialty ice cream shop started near my hometown in Portland, Oregon and will surely be a great late-night treat after a day at the parks! I have a feeling that Disney acquired Salt & Straw because Universal opened Voodoo Doughnuts, another Portland favorite albeit less family-friendly, at both of their locations. Ballast Point: Opening late 2018! Disneyland is opening their first brewery and outdoor beer garden. This brewery is popular among Californians and based out of San Diego. The menu will also be inspired by SoCal cuisine. Black Tap Burgers & Beer: Opening late 2018! This is a great option if you’re traveling with a mixed group of drinkers and non-drinkers. Black Tap is another local chain that will add to the new Downtown Disney vibe. The diner themed restaurant will have tons of burgers, including a vegan option, and their signature “CrazyShakes” topped with piles of cotton candy and candies. Uva Bar: This is my favorite place in Downtown Disney. It’s an outdoor bar located right in the middle of the walkway, between Catal and Build-A-Bear. It’s a great place to take in the atmosphere, listen to the street musicians, and people watch. However, if you’re looking for a quiet dinner, this might not be a great choice. Catal Restaurant: With menu items like assorted paellas and filet mignon, Catal is slightly more upscale than Tortilla Joe’s. 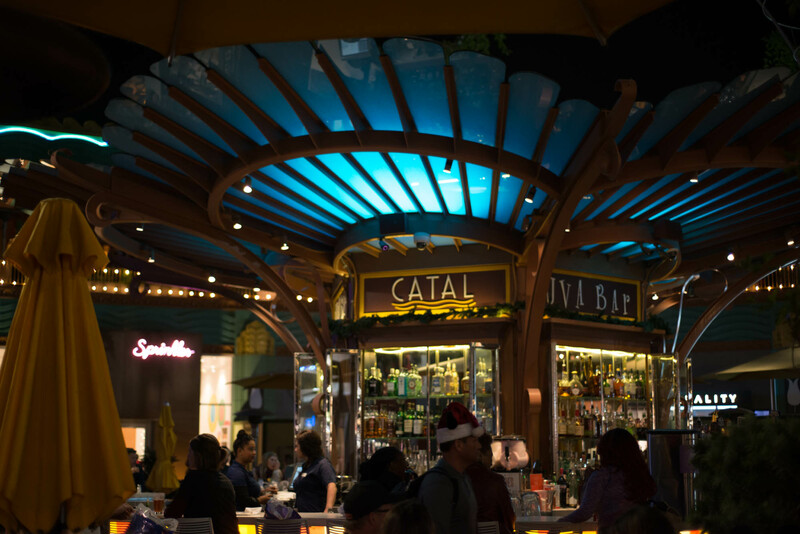 Outdoor seating at Catal is located on the 2nd floor and a prime spot for taking in the sights and sounds of Downtown Disney. Some say they’ve caught the Disneyland fireworks from upstairs. 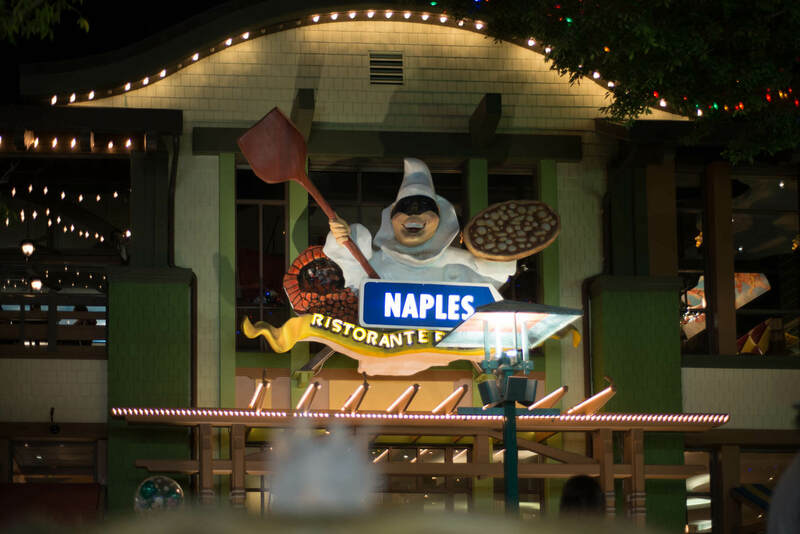 Naples: Due to lukewarm reviews, Naples is getting a lot of renovations. Reopening Fall 2018, Naples will have a new outside bar and patio and also 3 new wood-burning pizza ovens. This means that the food is also getting an upgrade. I can’t wait to have a glass of wine and gorge myself on a freshly made pizza under the Southern California stars. Ralph Brennan’s Jazz Kitchen: This is an optimal venue for a date night. There is nightly jazz and gumbo, all set under an open-air atrium design. If you’re in a hurry, they have an express window that serves yummy cajun fried goods and their popular beignets. Tortilla Joe’s: For a lively night out this place is an old standby. Fresh guacamole is made tableside and there’s a dedicated tequila bar where you can get margaritas made frozen or on the rocks. On Saturdays, an all-female mariachi band wanders the restaurant. Loads of fun! Coming in the next few years, Downtown Disney will have a brand new hotel in place of Rainforest Cafe and ESPN Zone (both have already closed down). Once the hotel opens, this area will hardly be recognizable and I honestly can’t wait. They’re slowly transforming it to what Disney Springs has become in Disney World: a shopping and food mecca for young adults. I can’t wait to watch this place transform over the years! 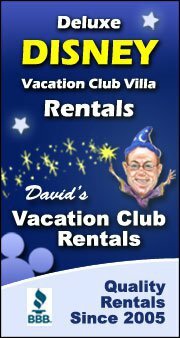 What’s your favorite adult-friendly thing to do at Disney? Comment below!